Wow! This is a great price! Right now this Under Armour Men's Big Logo UA T-Shirt 2-Pack is only $22 (Reg. $59.98) when you use code PZY22 at checkout! That just $11 a shirt! 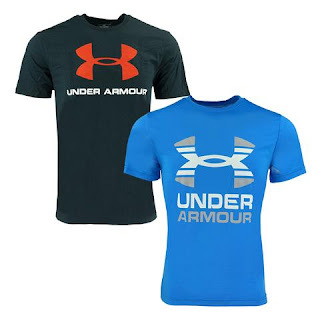 Look stylish and stay comfortable in the Under Armour Men's Big Logo UA T-Shirt 2-Pack. Constructed out of super soft UA fabric, this top provides lightweight, all day comfort. Moisture-wicking properties keep you dry, anti-odor technology keeps your gear fresh, and four-way stretch fabrication enhances mobility. Shipping is FREE on this offer. Offer ends 8/13/2018 or while supplies last.